Since 2011 the HOPE Outdoor Gallery in Austin has offered permission walls for aspiring street artists. Hope stands for “Helping Other People Everywhere”. The site was a failed condo development which was converted into an outdoor gallery with the help of artist Shepard Fairy in 2011. It has become quite the tourist and Austin attraction. Fairey of course is best known for his OBEY stickers, and the controversy over his successfully lifted Obama HOPE poster. This project was meant to have a shelf life of a couple years, but once the owner saw how much it had been embraced and loved by the community, he’s done everything he can to keep it going. The move was approved in February by the Austin Historical Landmark Commission. Part of the cement wall of the existing park will be moved to the new location, but the rest of the walls will be demolished. An amicable arrangement as compared to the 5Pointz dispute. Craig Hlavaty, Austin’s “Graffiti Park” to be demolished – Houston Chronicle, Houston Chronicle (Jan. 30, 2018), https://www.chron.com/news/houston-texas/texas/article/Austin-Graffiti-Park-to-be-demolished-Hope-Outdoor-12536309.php#photo-10133301. Nicole Raney, Downtown Austin’s iconic graffiti park searches for new home, Austin Culturemap (8.8.2016), http://austin.culturemap.com/news/arts/08-08-16-hope-outdoor-gallery-castle-hill-grafitti-new-location/?platform=hootsuite. Community bids fond farewell to HOPE Outdoor Gallery | Texas (Feb. 25, 2018), http://www.kxan.com/news/local/austin/community-bids-fond-farewell-to-hope-outdoor-gallery_20180312075742473/1031502585. Banksy’s ‘mobile lovers’. It sparked a dispute between the Boys’ Club where it was painted, and the Bristol City Council which sought to seize it. 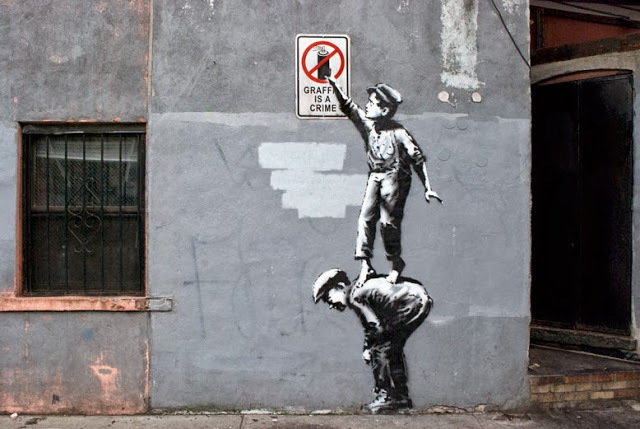 The artist Banksy creates valuable works of art, but he places them without permission, and this often raises property disputes. Peter Salib, a JD candidate at the University of Chicago has posted a draft of “The Law of Banksy: Who Owns Street Art?” It is an interesting examination of the problem, though comparative lawyers and those outside the United States may share my frustration that though the author uses as an example the dispute between a Boys’ Club in Bristol, and the Bristol City Council, and an artist who works frequently in the United Kingdom and all over the world, insists on focusing almost exclusively on American law. Street Art — generally, art that is produced on private property not owned by the artist and without permission — has entered the mainstream. Works by such artists as Banksy, Jean-Michel Basquiat, and Shepard Fairey now sell at the world’s most prestigious auction houses, fetching prices in the millions. Strangely, however, the law governing street art ownership is entirely undeveloped. The circumstances of street art’s creation — often involving artists’ clandestine application of their work to the sides of buildings owned by others — render traditional legal paradigms governing ownership intractable. If Banksy paints a valuable mural on the side of my house, who owns it? Me? Banksy? Someone else? American law is currently ill-equipped to answer the question. This article rigorously investigates the problem of street art ownership. It accounts for the unusual circumstances of street art creation and distribution. It then considers the possible legal regimes for governing street art ownership and comes to a surprising recommendation. Peter N. Salib, The Law of Banksy: Who Owns Street Art?, SSRN Scholarly Paper ID 2711789 (Social Science Research Network), Jan. 6, 2016. Owner of Banksy Mobile Lovers youth club received death threats, The Independent (Aug. 27, 2014), http://www.independent.co.uk/arts-entertainment/art/news/banksy-mobile-lovers-sold-owner-of-youth-club-where-artwork-appeared-in-bristol-received-death-9695327.html. “The Street is in Play”, Banksy, Chinatown, Oct. 2013. Banksy posted pictures of the finished works, but wouldn’t say where they were located, which meant that Banksy fans had to hunt around the city to find them—all while hoping that the pieces hadn’t been removed or painted over before they could be discovered. Over the course of the month, Banksy stirred up controversy with the political content of some of the work, and provoked the usual brouhaha over whether street art is any different from everyday vandalism. But Banksy also got the citizens of New York talking nearly every day about art and social issues, and he had people paying more attention to their surroundings, looking for hidden Banksys. He kept folks on their toes. . . . The documentary airs Nov. 17th on HBO.